The National Theatre Workshop for the Handicapped-Crosby in Belfast was foreclosed upon the city of Belfast in 2010 for failure to pay a $700 sewer bill. 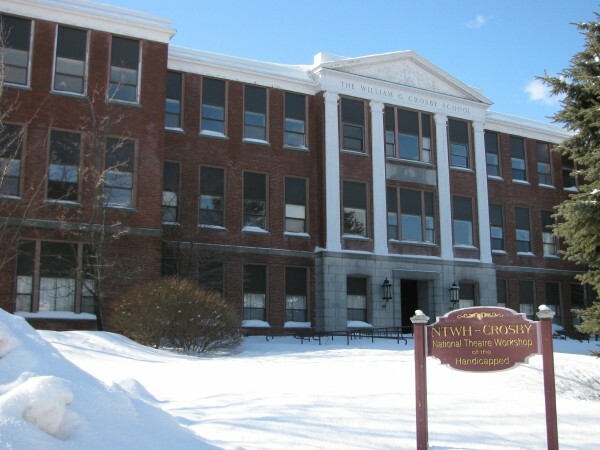 BELFAST, Maine — The fate of the National Theatre Workshop for the Handicapped building, which was temporarily seized by the city two years ago for nonpayment of a $700 sewer bill, appears to be in flux once again. According to Belfast Economic Development Director Thomas Kittredge, the owners of the three-story former Crosby High School on Church Street are looking at “potential redevelopment options” for the building, which was last assessed by the city at $3.6 million in 2003. In recent weeks, work crews have been laboring to spruce up the exterior of the structure. A representative from the New York-based theater workshop declined to comment Wednesday on the future of the Belfast site, and whether it will be listed for sale. “There’s no proposal in hand,” Kittredge said. The property is located in a residential 1 urban zoning district, with limited uses allowed there. Those include: single-family and two-family housing, municipal uses, limited professional offices, schools and philanthropic, fraternal and similar institutions. “Since we don’t own the property, it’s only through zoning we can express what uses are allowed at that site,” Kittredge said. The workshop was founded by Rick Curry in 1977 in New York City to provide professional theater skills to the disabled. The group established the Belfast branch in 1996 as a seasonal adjunct, and purchased the former school from the city for $200,000. Curry, who has since become a Jesuit priest, invested an estimated $3.5 million in the building, according to the organization. For several summers, the city bustled with theater productions and seasonal residents thanks to the workshop. But a few years ago, activity there began to taper off, as Curry shifted the nonprofit’s focus toward helping disabled veterans in Washington, D.C. In 2010, the deteriorating building became the property of the city of Belfast as per the state’s automatic lien foreclosure statute. Title to the building automatically transferred to the city after the workshop failed to pay in a timely fashion after a lien for the sewer bill was filed in the registry of deeds. But the city decided to return the structure to the nonprofit last May, after owners stepped up to clean up the building, fix broken windows, do mold remediation and hire a regular caretaker. Kittredge said that city officials have met with representatives from the workshop, whom he described as doing “due diligence” about the next step for the building. “I think they’re keeping an open mind,” he said.